← Long reef, possibly the best so far. A weekend back in the UK and an early ferry out Sunday morning, meant that the flying opportunities didn’t really look that promising. However I had taken my wing over to the UK with me with the secret hope that Sunday would turn out OK and I could get up in the air. 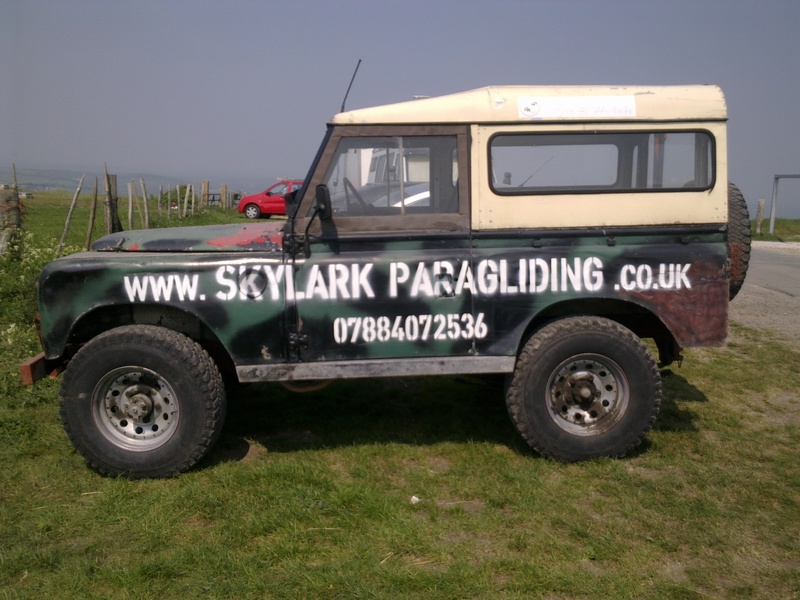 Thanks to the power of the internet I had sent a mail to Dave Lewis of Skylark paragliding who is also a member of the Southern Hang Gliding Club which runs the sites on the South Downs which lie north of Brighton. An email exchange the night before and Dave suggested that we meet at a local farm cafe in the morning for a brief as he was meeting 3 wantabe tandem passengers as well. I arrived a little early, found the cafe, which was the excellent Middle farm a place that obviously is repeating the benefits of a little agricultural diversification. I spotted a tall guy dressed as a paragliding Skygod should be, and approached for confirmation. As a side point how do I get that look? Is it planned or just naturally acquired after you reach 1000 hours? Coffees in, I and intrepid virgin tandem pilots waited for Dave to brief on the day’s activities. This was more for the tandem passengers not for me, but it is worth listening to a flying brief no matter what your level as you never know what you may learn. One of the passengers was a game 80 year old, wheel chair bound, but not limited. 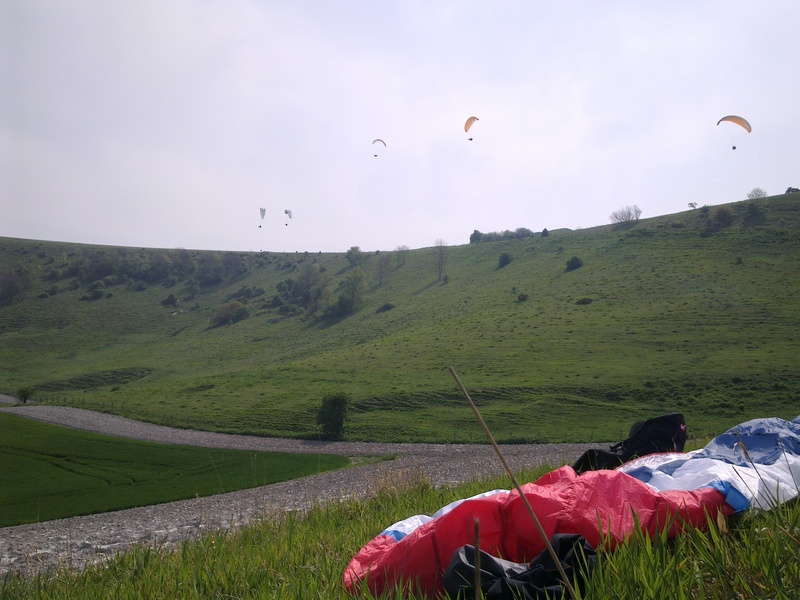 She listened and threw in a few comments while Dave went through the BHPA regulations and tandem risks and rewards, I was greatly impressed by Dave’s briefing style, succeeding in being not patronising but informative, getting alien paragliding speak across to novice ears. 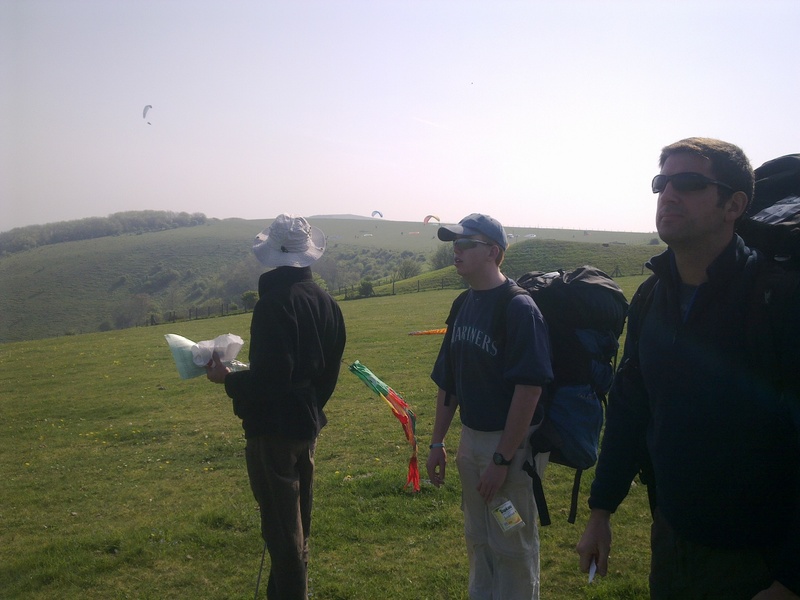 We decamped then to hit the hills, the best, according to our skygod, being Firle, I had already looked this site up on the net the night before as the SHGC site has a very comprehensive site guide available. Driving up , I was pleased to see wings in the air, and as I got closer quite a few wings in the air, counting 11 when we arrived up on the hill at around 10 in the morning. The wind was onto the face but did have a tendency to drop off a bit now and again. However the most inviting aspect of the site being the smooth rounded top, and large, very large top landing area. Dave gave me a brief on the site, pointing out the landing areas below, and the need to be extra careful with gate closure. The site is under jeopardy since a gate was left open in the field below and cattle then escaping across the Sussex country side, an event which is rightly going to upset farm and land owners. This was then followed by. Dave’s final point proved, I set about unpacking and running through my wing inspection and watching other pilots launch. Having trained in the alps, all launches so far had required me to get the wing in the air through a bit of leg power. This situation had changed when I was presented with strong wind and ridges in New Zealand and Australia, so the site of many people taking long strides and then lifting off was not new, but I was still a little nervous about the launch. Even more so considering that now I counted 13 wings in the air, and more constantly being inflated on the ground. Still wing unpacked, checked, harness on I couldn’t put it off any longer, I inflated the wing having decided that first I would stay on the ground and get a feel for the conditions and wing. The wing came up straight and having learnt from my last attempts, I keep the brake inputs light to avoid being dragged back. Turning I then spent some time balancing the wing above my head getting used the feel of the brakes and response of the wing. I did this a couple of more times, the major reason being that I wanted to ensure that I had chosen the take off point and time, whereas at long Reef my launches were hurried and not that controlled. Seeing a lull in the number of wings in the air I choose my moment and lifted off, going up right away, the lift wasn’t strong but sufficient for many, but soon I was panicking as I started slipping down the slope. I then hugged the ridge a little closer and found the lift was strong in the bowl and managed to gain height. With the number of wings in the air I was constantly on edge and scanning. I think the general air experience of gliders and other types helps here, without my gliding experience of thermals I would have surely been more stressed with 12 other wings in the air. I decided to top land, came around but made a complete hash of it, crabbing in too fast and landing with a bump, then getting dragged a bit before killing the wing with the Cs. Not turning in higher was my major mistake and having to be close to the ground with not enough height to complete by into wind approach. I also suffered from not really understanding the wing and its range and stability with the ridge lift. The second flight also ended in an arse landing for me and being dragged again. I approached Dave to talk this through, he suggested that I could use a lot more brake than I was used too without any problems and ensure I have enough height, with the conditions being good I should try balancing the wind and wing walking forward to the edge of the ridge and practice hovering back matching brake to wind speed, and practice progressively applying full brake to land back on the ground. With this is mind I made a few attempts at launching hovering, maneuvering just above the ground. One attempt saw the wing collapse onto our tandem pilot’s wheelchair, luckily she wasn’t sat in it at the time, having got up to be strapped into the tandem harness. I de-wheel chaired the wing, practicing a few more times, then choosing to take off onto the ridge. 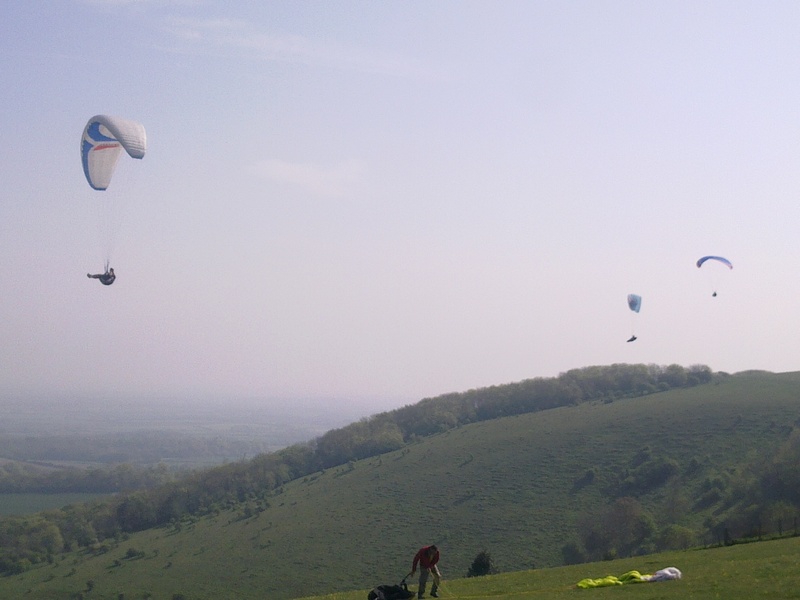 this time I quickly found a broken thermal riding it up to enough height to jump bowls I then climbed in a second thermal to be one of the highest pilots on the ridge, by this time the world was launching in the hope that this was the breeze convergence that Sussex is famous for, all hoping to be corkscrewed up to 3500 feet. One of the hopefuls was our 80 year old pilot, having launched with a whoop soon after me, we spent 2 or 3 turns in the thermal, before Dave whisked her off to the other end of the ridge. I hope that I am still flying at 80! I enjoyed nearly 40 minutes, climbing being up there with some good pilots, the Buzz Z3 certainly becoming a nice wing to fly as I get more used to it, the turbulence of the spring thermals was noticed in a couple of wing tip flutters, probably well known to more experienced pilots, I still give a little jump when I hear them, looking up quickly to check the wing. The Z3 behaved well, giving no cause for concern and I enjoyed beating up and down the ridge, a couple of shouts were heard with people getting close to others, but I had no problems, but soon I found myself slipping down the slope again, and mindful of my earlier top landing, I decided to commit to the lower landing arriving in the chalk field below. I had gone from being higher than most to being lower than all in a couple of minutes. Come join me my pretties, come join me mahwahahahaha . 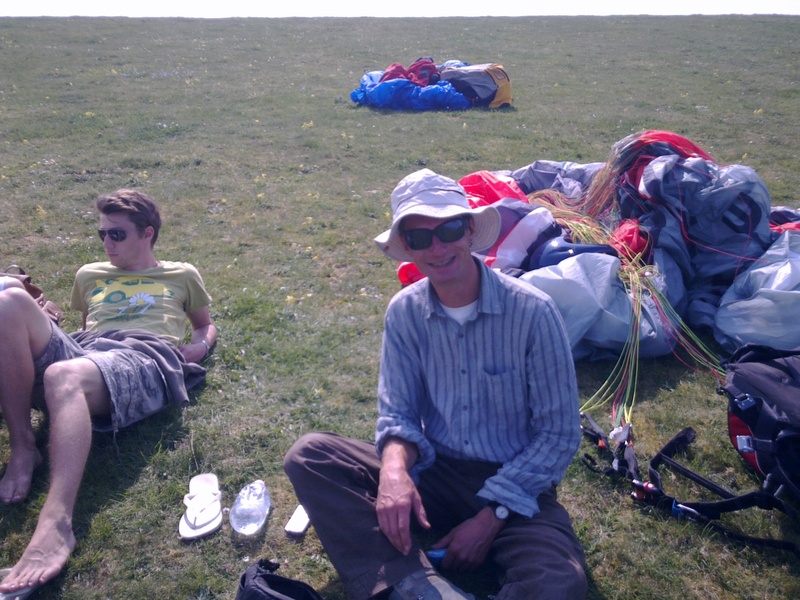 I was soon joined by other pilots, which at least gave me a little satisfaction in knowing that the conditions were dropping off, Dave landed as well with his tandem and our 12 months out of practice friend, having survived flying again. His lay off induced by a twisted knee, we packed up while Dave, convinced there was enough wind left his tandy and kited himself back up the slope. Me and my out of practice new found buddy, started the yomp back up the road. The tandy passenger said his mum was coming down to collect him, sweet. So we waited for the cheapest taxi firm to turn up, only for mum’s hyundai to be outbid by a white van, equipped with wind sock mirror adornments. We arrived at the top with most people packing up and heading off for Bo-Peep, my hasterly rearranged ferry crossing was looming and I felt that I should make tracks, although a stint on Bo-peep would have been nice. I left after saying thanks to Dave, hugely satisfied with my flying day, I had learnt some new skills and flown another new site, I shall defiantly be back! 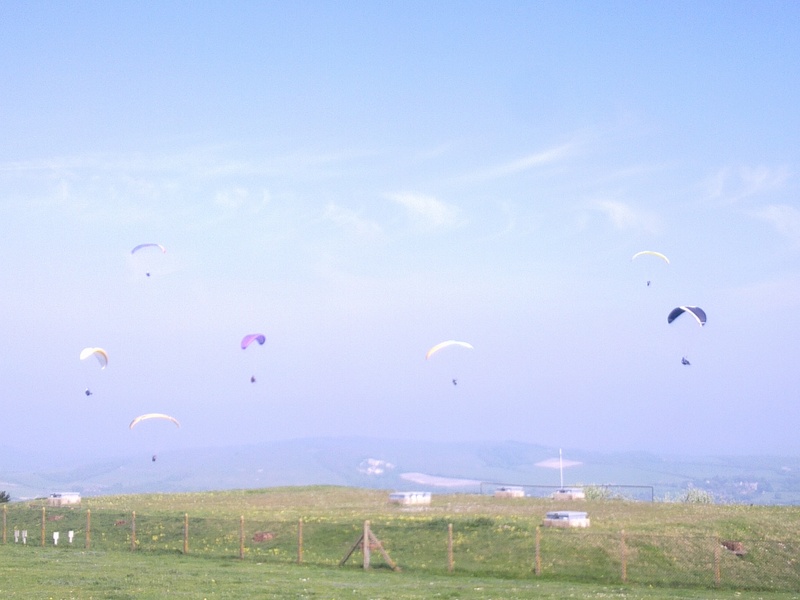 This entry was posted in Paragliding, UK and tagged Bo-peep, buzz z3, Dave Lewis, Firle, flying, ozone, Skylark paragliding, sussex, top landings. Bookmark the permalink.